I am not very adventurous when it comes to food. I usually eat the same things, prepared differently. It works for me. I usually don’t get sick of eating the same foods – but there are times where I do need a change. For example, courgettes (zucchini) – which I ate with dinner every day, and soon became very tired of. When coming to Korea, I totally neglected myself with alcohol and bad food. Yes, I’d done the same prior to Korea – but coming here felt like I was on a vacation from my own life. That, because I ~couldn’t read~ the food labels, or know where to find or ask for certain foods – I’d just not eat them. Thee worst excuse. When I started to take the time to actively look for fruits and vegetables that I recongised and liked, I realized that it really wasn’t that hard. My diet started off drinking the Herbalife shake twice a day. I felt it was convienent because I really did not like eating so early in the morning, and it seemed a lot easier to have. I would take my shake to work and drink it at lunch and then eat a real meal for dinner. After a month and a bit, I decided that I missed food, so ditched the Herbalife and began eating right. I started my day with some Special K with fat free milk. 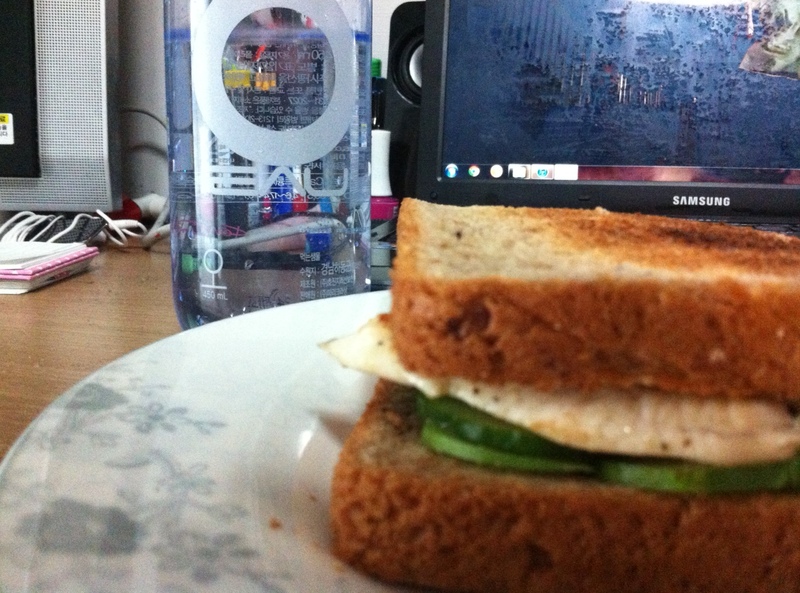 For lunch I would have one skinless chicken breast on brown bread with cucumber slices (delicious!). 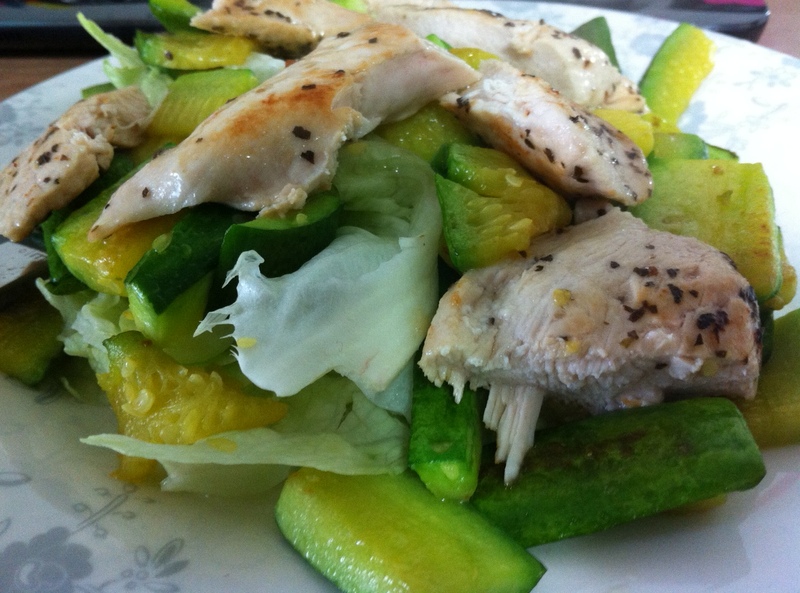 For dinner, I would have one skinless chicken breast, with lots of veg – lettuce, courgettes etc. I also squeezed a lemon over the chicken, and used basil. 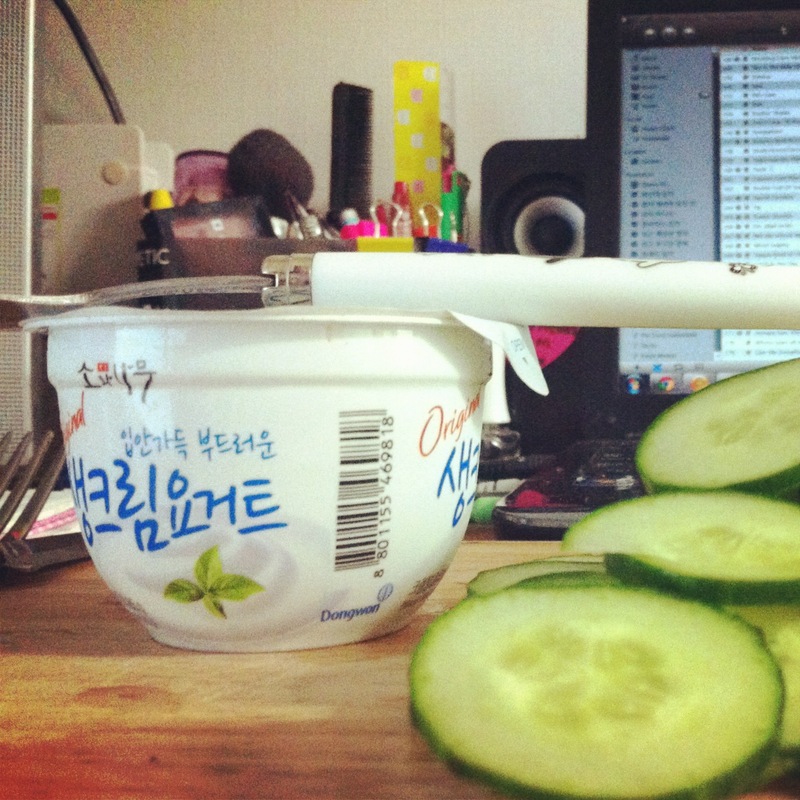 Throughout my day, I would have two snacks consisting of original or Greek yoghurt with cucumbers and a handful of almonds. I’ve since changed my eating a little by having a smoothie for breakfast. I have fat free milk, one small tub of plain yoghurt, banana, strawberries, blueberries and a handful of almonds. Sometimes, I’ll change it around with just strawberries and banana, or peanut butter and honey, or kiwi. Basically, fat free milk, small tub of plain yoghurt with some fruits and sometimes nuts for the crunch. I really like having that in the morning. 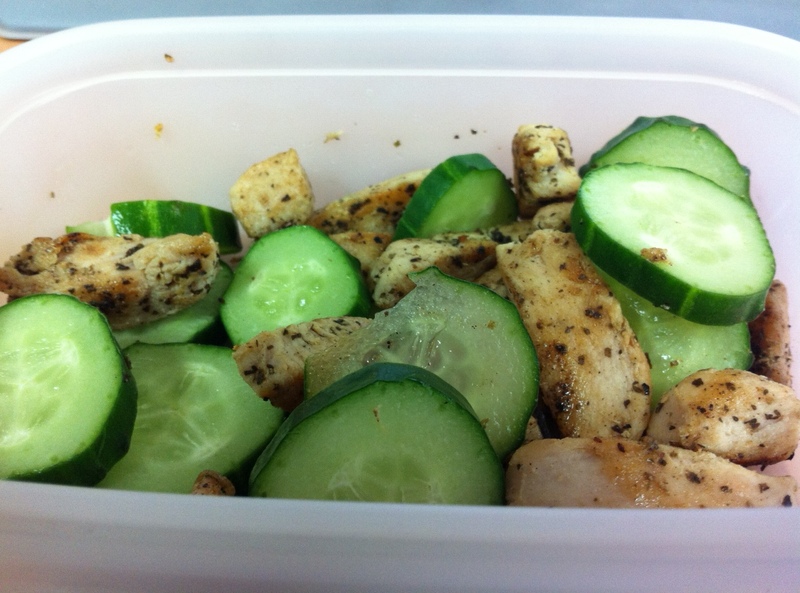 I’ve since decided to cut out the bread every day, so I eat one chicken breast with cucumber for lunch. For dinner, I have one chicken breast with cucumber, peas, sometimes some brown rice. 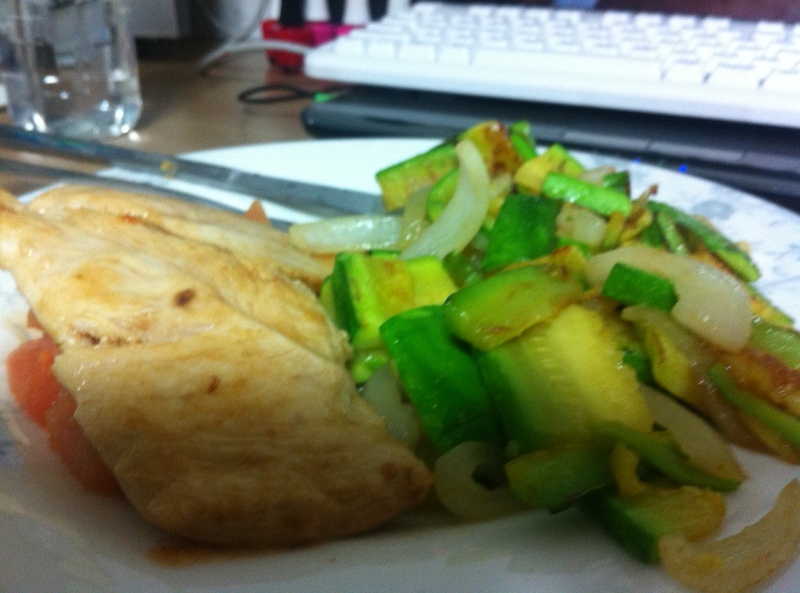 Surprisingly, I do not get sick of the chicken – I do not like fish! Here are some pictures of the meals that I prepare. In terms of exercise, I do 35-45 minutes at the gym desirably 4 times a week. I do not go over weekends. I do what I can. I am not fit, by any means. I’ve only just started running on the treadmill and I am out of breath after 30 seconds, AND THAT’S OK! Do what you can, push yourself and remember: The body achieves what the mind believes. Great job girl! I’m so proud of you. Yes, once you get on the train…it is actually quite easy to lose weight while living in South Korea. I think so many expats go toward fast food or ‘comfort food’ from home…they forget that a lot of it is unhealthy for you! Thanks so much! This community has been a great motivation for me, too. I didn’t think of it as “comfort food from home” – you are very right! Thanks for the rad comment. Good for you! I can totally relate to the “coming here felt like I was on a vacation from my own life” statement. My first year teaching here so unhealthy in so many ways! Second year has been all about getting on track. I have learnt so much about nutrition and food, too. Overall, Korea has just strengthened me in so many ways! Thanks for the great comment! I really appreciate it when people can relate to what I’m saying.